Your home is your palace, so make it look like one! You can make a grand statement in your home without ever saying a word. Choosing extravagant furniture styles doesn’t have to be daunting, and can be extremely rewarding. You can obtain a rich, lavish look by choosing a few choice pieces that will add panache to your home. 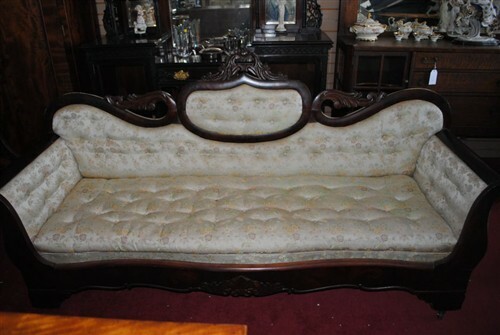 This Great Antique Transitional Empire To Rococo Revival Victorian Mahogany Sofa is a really neat find. With its fine mahogany frame, fabulously carved crest and apron, rolled arms, actually very comfortable, forever in style. Click here for more information! Certain furniture styles like Victorian, Rococo, and Eastlake are known for their ornamental qualities. Incised lines, inlaid wood or marble, relief carvings, and flourishes characterize these pieces giving lending quality and craftsmanship to their design. This Marble Topped Hand Carved Mahogany Rococo Console Table Louis XV is a great example of a piece with these ornamental qualities. 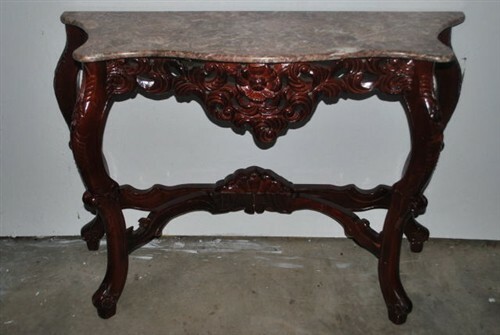 The Rococo console is made out of solid, hand carved mahogany. It has thick, heavy, mahogany, cabriolet legs with trestle base and carved pad scroll feet. Click here to read more! Dream of a home without moving somewhere new and without spending a fortune on new furniture! Come into Aardvark today or visit our online store for more great finds!